This listening bench has now finished its two-year tour. 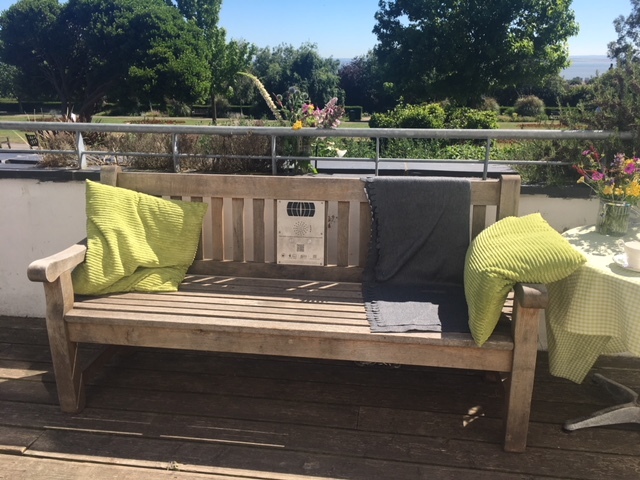 The bench has been delivered to arts organisation METAL, based in Chalkwell Hall, Chalkwell Park, Southend-on-Sea. METAL will incorporate the bench into their NetPark, a project encouraging engagement with digital art in outdoor spaces, so keep an eye on your GeoCaching spots! Did you enjoy using the bench while it was on tour? We would love to hear your feedback. You can share your thoughts in a quick online survey. This bench was generously purchased by the Friends of Historic Essex. What is permaculture? Graham Burnett explains in this first clip from an interview. Graham Burnett explains how Project 49 can help make small differences to cause a big improvement. Franck Gérard, METAL’s artist-in-residence, talks about taking photos of Southend and his collaboration with the Echo newspaper. The first track from Spiky Black’s NetPark app for Chalkwell Park – what would you call your ideal rose? Rachel Lichtenstein’s personal relationship with Chalkwell Hall. Part of a soundtrack commissioned by METAL in 2009 when they refurbished the Hall.